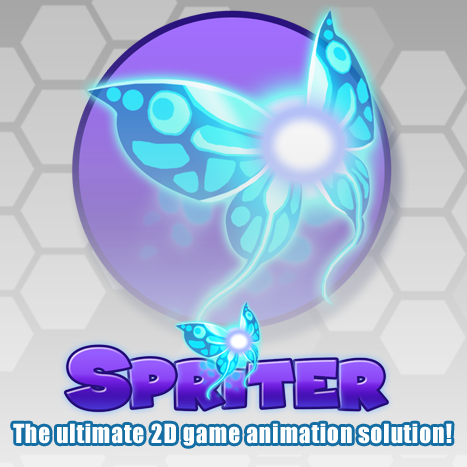 Spriter Pro, the ultimate animation solution for creators of 2d games. Use Animation Data Directly In Your Game. Animations are recreated in real-time using the sprite piece images just like in Spriter. Animations are much smoother and more detailed . Manipulate animations via game events. Reuse your animation data for completely new characters or character customizations. Saves a lot of memory your game would otherwise take up with spritesheets. Using keyframes you can quickly lay out major frame changes. Frames in-between the keyframes are then automatically created. You can then edit individual frames as desired to make your animations really shine. Animations can be exported as spritesheets, animated GIF files, sequential images and more. Reuse your previous animations by incorporating them in new ones. Create perfect, smooth transitions and varieties that save time by working with animations you've already created. Adjust animation easing with several curve settings to help make your animations more lifelike. Create pixel perfect retro style animations with Pixel Art Mode. Spawn bullets, particle effects, or anything that requires precise locations and angles. Set up guide lines and load in background images to work on top of. Separate characters into important collision areas. Inverse Kinematics. Change a bone's parent, add or remove bones, or even change sprite pieces mid-animation. Import sound effects and even use lip-syncing with built-in Papagayo support. Everyone who purchases Spriter Pro will receive FREE "Essentials" versions of every art pack BrashMonkey makes. The "Essentials" editions don't have as much content as the full commercial versions, but offer a fantastic starting point for creating the animations you might require for your game projects. Spriter for Windows requires Windows Vista or newer. Spriter for Mac requires OSX 10.7 or newer. Only Ubuntu 14 is officially supported for Linux. A Spriter Pro license is for one user, but is not restricted to a specific number of computers. When you buy a Spriter Pro license feel free to install and register it on any number of your own computers, but remember that only you are allowed to use it and it can’t be used simultaneously on two or more systems. Because your purchase is for an activation serial number, all sales are final. As there are no refunds, please be sure to test out the free version of Spriter fully before purchasing the enhanced commercial version. We take your privacy seriously and take all reasonable measures to protect your personal information. Any personal information we receive will only be used to fulfill your order or notify you of free product updates, such as when “Essentials” Art packs (free with purchase of Spriter Pro) become available. We also want to be able to provide you with a way to retrieve your serial number if you happen to misplace it. We will never sell or redistribute your information to anyone without your consent. Spriter End User License Agreement. I have read the terms and conditions and agree to them. Separate characters into important collision areas. Spriter has cut my animation times in half, it's really easy to use once you get familiar with it, I was a little skeptical when I heard about it but after watching a couple of the tutorial videos I just knew this product was going to make my life easier, and I was right. Even if the engine you're using doesn't support it, Spriter is a great tool to create very fluid and professional looking animations that you can export as png/gif files; It's an excellent product!